I was a busy little beader gearing up for pauwau season. I made a headband for a dear friend from size 8 delicas. 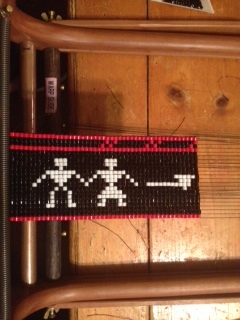 My loom has interchangeable spring coils to accommodate different size/type beads. 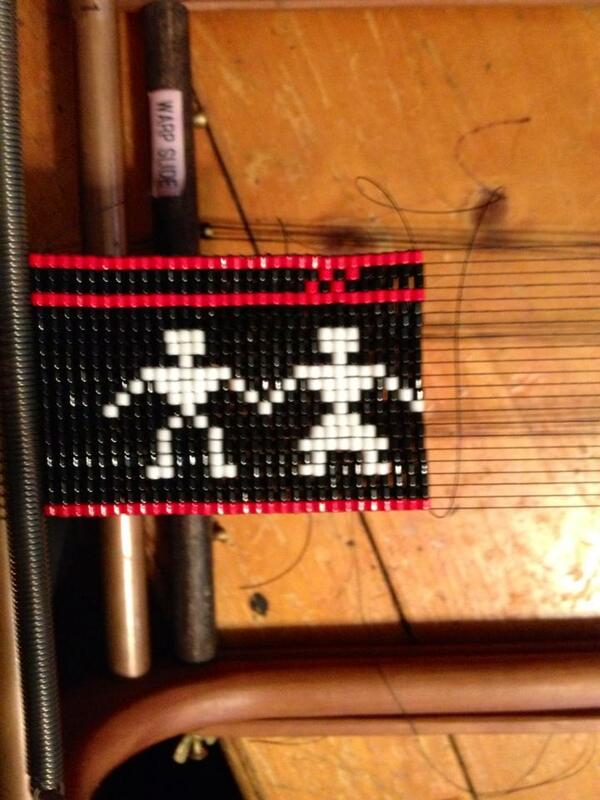 This was the first time I’ve loomed with beads that large and I was happy to see how fast it went. Here are some pictures but I neglected to photograph the completed project. Duh!!!! The headband tells the story of our different Nipmuc communities coming together as one using ceremony as the uniting force – specifically the pipe ceremony. You can see the pipe in this picture. I alternated men and women for both sexes are equally important in our community. I also used two different color people, white and green, to symbolize different bands of Nipmucs. The headband was gifted to our pipe carrier. The bowl of the pipe he carries was made from cumberlandite – a very special stone that exists in only one place on this earth, Cumberland, Rhode Island. Cumberland is within Nipmuc traditional territory. Imagine a stone that only exists here in Nipmuc country!! I wanted to add the stone in some way to the headband. Keep in mind that the pictures you are seeing are of my final design. I tried a few different designs before I settled on this one. We used my Dremel to cut, shape and polish the stone and set it at the center of our ‘community’. I’ve never told a story in beads before and I’m not quite sure if the headband’s recipient actually understands the message I tried to convey….but he is a good sport and wore the headband at the Hassanamisco pauwau. 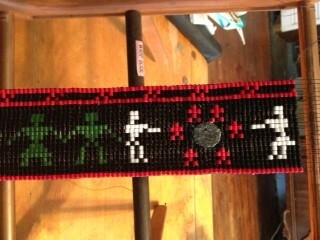 I think I will continue to tell stories through my beadwork – well, at least I’ll try. Award-winning Canadian Author Claims that Dartmouth Indians are Really Nipmuc?